A name like Lizardine can’t help but provoke a question mark! Lizardine? Scaly? Lizardy? Reptile-ish? Lizardine is actually a beautiful real metal thread used in goldwork. I’d like to give you a little preview of what it is, and then go into further detail later by comparing to another more familiar real metal thread, pearl purl. The photo above comes from the little tutorial on using pearl purl this way. The first time I ever used the technique was when I worked Margaret Cobleigh’s “Golden Pomegranate” featured in Inspirations Magazine. I fell in love with the technique – it makes such a pretty edge! The same technique works with Lizardine, but the look produced is somewhat different because of the nature of the metal thread. 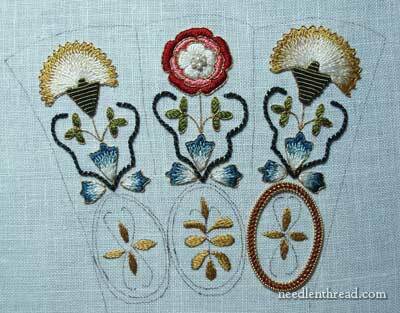 On the Floral Glove project, the roundels are worked in both pearl purl (couched plain) and Lizardine wound with silk. I have to admit, I’m a sucker for this type of metal thread! April 6, 2010 Goldwork Embroidery: Finis! The roundel on your floral glove project looks amazing. Can’t wait to see the finished item. I will have a good look at the tutorial on using pearl purl, but I was wondering how you would advise a complete goldwork beginner to make a start? Mary, thanks for such great photos. 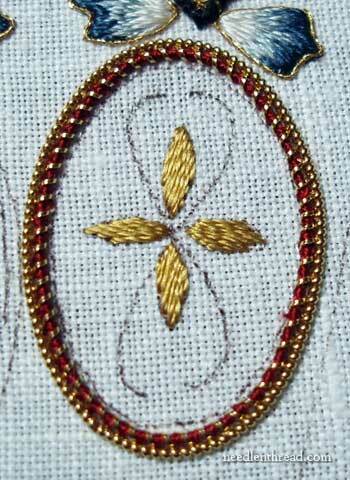 I’d never heard of this goldwork thread. 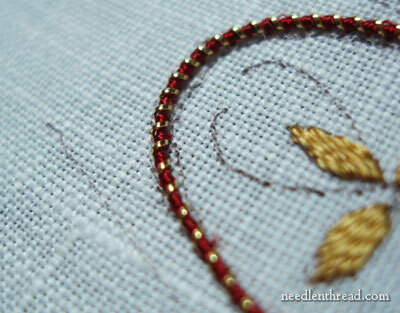 I love gold thread, and this coily stuff [sorry] looks so interesting. You are always so full of information. Cheers. The oval looks perfect. How do you get the beginning and end to line up? I received my FG finishing kit in the post yesterday. I arrived home late and tire so did not open the bag and paw over the goodies but even through the bag they look fabulous. Yes, yes, YES! Goodness Mary, you’ll have me entirely won over to gold yet, epecially with the silk combination. yes, I ‘know’ or at least can see what you mean! Beautiful edging..beautiful work! Thanks for another great tip! Beautiful stitching duo! Looks so elegant around the medallion in the FG project. Will enjoy trying out the lizardine…but not right away as I am deep into stitching motifs from the book “Flowers for Elizabeth” which are lovely. Yes it is absolutely beautiful! You are so naughty! Now there is another kind of thread I am lusting after! Yes, I know what you mean about silk and gold. It is so luxurious, so rich and so gorgeous! This is the most beautiful project. Elaine, I think the best way to start is with a kit, personally, because that way, you don’t have to worry about what threads to buy and what size. Real metal threads can be a little confusing at first. Luckily, there in the UK, you have two top producers of European mental threads – Benton & Johnson and Golden Threads. Benton & Johnson sells some goldwork kits on their website. You’ve also got the Royal School of Needlework that offers two-day goldwork classes, if you’re interested in going that route. I’m sure there are other suppliers of goldwork and real metal thread kits in the UK, but if you can’t find something you like, I’d suggest checking out Tanja Berlin (berlinembroidery.com) in Canada, or Alison Cole or Mary Brown in Australia – both of them offer gorgeous goldwork kits, in various levels of difficulty. Jaonne – the ends line easier than one would think! They require maybe a little twisting or fiddling to get them to fit together, but the key is couching the first pearl or the first spiral and the last – don’t skip those! With pearl purl, it’s not always necessary to couch every spiral, but with the lizardine and silk, the couching is done with the same silk, so if you miss a spiral, it’s more noticeable, so each spiral of silk is couched. In any case, as long as the first spiral and the last are couched, and you’ve manipulated the thread to turn so that the cut is down towards the fabric, the ends usually come together pretty easily. Hope that helps! Glad you all like the look of this – it’s my favorite part so far! I haven’t started on the other roundels yet. I need time where I can really concentrate on them, so that I can work out the spacing. I don’t want them to look squished, but I know their edges will touch. I probably should’ve started with the one on the left, and moved to the right, since the one on the right has more room next to the edge of the design. But I think it’ll still work out ok – can’t wait to get to them! Oh, Mary, it’s beautiful! Excuse my ignorance since I haven’t yet done goldwork. Do you wear cotton gloves while working with the lizardine, pearl purl, or gold threads so as not to smudge or tarnish them, or is that not a problem? Elaine – Thanks for the link to Golden Hinde – I’ve seen their website before, but couldn’t remember where / what it was. Now I’ve added it to my “UK Favorites”! Thank you. They have some very interesting looking beginner’s kits. They also apparently show at The Knitting & Stitching Show at Alexandra Palace in North London so it will be possible to actually look at the kits first. That is just gorgeous. I read your blog all the time, just so I can admire your work. Simply beautiful. I love the contrast of the red silk with the gold. I am now hoping that I get something similar soon. These wonderful goldwork posts are making it more and more difficult for me to resist my hankering to do some Or Nue work. The floral glove is coming really lovely!! 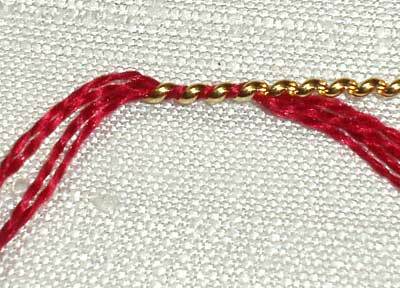 There is a very good and complete source in UK for Goldwork materials at competitive prices, its not a web site but this is the link for the price list and is possible to order sending an email, the payment is by Paypal after receiving the total. I have purchased many times and works very well. This is really wonderful.Especially the purl when combined with silk ….WOW.we don’t get that kind of purl in my place:(.The photos are very clear.I like all your work. The technique of using the lizardine with the pearl purl for outlining is very nice. I have a kind of “Stitch Glitch” technical question. Can stretched lizardine or pearl purl be used on a design with sharp corners? 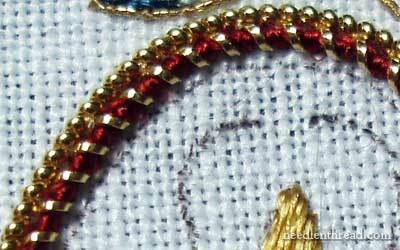 In looking back through all of the old posts on goldwork, most stretch pearl purl is used on curved lines. I’m looking at the pattern here: https://www.needlenthread.com/2010/07/hand-embroidery-pattern-cross-lilies.html – and wondering if/how this technique might look going around the cross. The piece would be done in rich red/wines/coral/green colors and gold work, rather than white work. I’m just curious to know if it would be a mistake to try and do sharp corners with these gold threads.